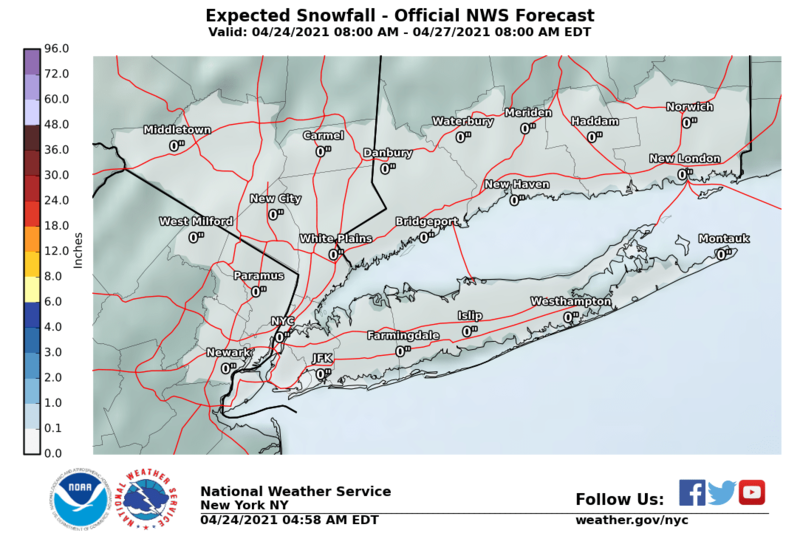 In case your Thanksgiving travel plans involve Monday night into early Tuesday morning there might be some snow up the Hudson Valley along and north of Route 84. This looks to be a light event (hopefully) as low pressure develops on a stalled frontal boundary Monday night into Tuesday morning. Amounts should be on the light side and with a limited amount of cold air around this time verses last Thursday, this should be minor. It won’t be a problem closer to the coast south of Route 84 as it will be too warm for anything other than some rain Monday night into Tuesday morning. This time around there is no cold high in New England and there is not a whole lot of moisture coming up from the south. Last Thursday we saw a loaded low moving northward up the East Coast that brought in a ton of moisture into the cold air mass. With these missing ingredients as well as the lack of a strong upper air trough moving through, this should not be problematic even in areas that see snow. Recent NAM model trends have been shifting northward with this system making for a warmer atmosphere south of Route 84. On to tonight’s weather which shows the frontal boundary to the north of us with a stripe of light snows across upstate NY and Northwest Pennsylvania moving northeastward. We will sit in clouds tonight with temperatures in the upper 30s and lower 40s and nothing more than passing shower will occur overnight into Monday morning. After that we will have clouds around with perhaps some brightening of skies. Temperatures will reach the upper 40s to lower 50s. Monday night into Tuesday we will see some rain move through as low pressure develops right along the immediate coast and moves to the northeast. Any rain should be done before daybreak and it will be on the light side (under 1/4 inch in most places) with leftover clouds to follow and temperatures in the 40s. Colder air will begin to arrive Tuesday night but we will have to wait until Wednesday as an arctic front passes through. That front will be dry for the most part with just some passing clouds and a scattered snow shower or two and some sunshine in between. Temperatures Tuesday will be in the 40s. Wednesday’s temperatures will settle into the 30s as the cold air rushes in during the afternoon and at night. There will be no weather related travel days Wednesday out of our area. By Thanksgiving morning we will be in the teens to mid 20s and in spite of sunshine Thursday, Thanksgiving day highs will struggle to the upper 20s and lower 30s. Then it will be another cold night Thursday night into Friday morning. It will be the coldest Thanksgiving here since 2002 when temperatures topped only in the low 30s and lows were down in the 20s and teens. Friday we wake up to teens and lower 20s in many areas under a clear sky. Friday highs with sunshine should reach the middle to upper 30s. Next weekend we will be watching low pressure developing to our south and heading northeastward up the coast in some fashion. The cold air will be gone by then and it looks like we could see some rain here next Saturday night and Sunday as the low nears us. For the most part this week, other than the very cold temperatures, it should be a quiet smooth sail.